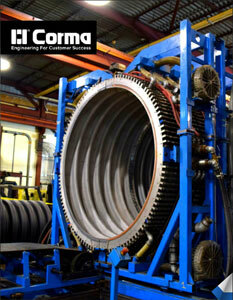 Business View Magazine profiles Corma, Inc., manufacturer of corrugated plastic pipe manufacturing equipment, located in Concord (Toronto), Ontario, Canada. 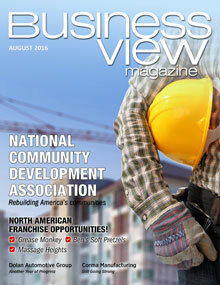 The cover of Business View Magazine’s July 2015 issue featured a picture of 76 year-old Manfred Lupke, President and CEO of Corma, Inc., one of the world’s leading producers of the machinery and die tooling equipment for corrugated plastic pipe manufacturing. Lupke, who immigrated to Canada from Germany in 1969, and went on to generate approximately 850 separate patents for innovative engineering, is still going strong, according to his son, Stefan, the company’s Executive Vice President. “We’re aiming at his 77th birthday, this summer, and he’s not going anywhere, soon,” the younger Lupke exclaims. Working on a machine that can make pipe bigger than 60 inches is a project that the senior Lupke started awhile ago, but according to his son, “never put enough energy behind. Now it looks like it’s finally going to be realized and we’re pretty excited about that. People have hinted that they’d like to go bigger, but I don’t think they’re expecting it at any time soon. But now we’ve dedicated a team to this project and we’re hoping to have our trials done and have a 72” (1800mm.) I.D. pipe sample at the upcoming K show,” he says. K- 2016, the world’s largest trade fair for plastics and rubber, will take place in Dusseldorf, Germany, this coming October. Another innovation at Corma is the new Corma Super Coupling. Lupke explains: “The piping system, generally, is only as good as the fittings – the whole coupling system. And what we’ve seen is – especially in North America – a number of the pipe producers are using a very, very short coupler. And the DOTs (Departments of Transportation) are complaining because when there are heavy loads on it – you have very little engagement between the male and female ends of the coupler. So the integrity of the whole structure is compromised. This is an issue, especially in the States, and there’s a lot of push back because of pipe system failures. Lupke stresses that Corma does not manufacture pipe, itself, but only designs, builds, and sells the pipe making machines utilized by pipe extruder manufacturers. Today, Corma sells and services its machinery in over 100 markets, worldwide. It recently opened offices in El Salvador and Brazil to better support its customers in Central and South America, and the company has also made a strong commitment to its customers in India by establishing a Sales and Service Center in Mumbai. It has also strengthened its position in Europe. “The three largest pipe producers in Europe are all our customers, now,” says Lupke, “and our German competition continues to weaken.” In addition, Lupke remarks that the competition from Chinese firms is also getting weaker. “The Chinese haven’t executed very well; they’ve lost momentum. Their equipment has gotten more expensive, thought the quality and service and after sales has not,” he says. Adding credence to the last part of that mission statement was Corma’s recent receipt of the Innovation in Production or Technological Advancement Award presented by the Vaughan Chamber of Commerce Business Achievement Awards – just another feather in the cap for a company that’s still going strong. Check out this handpicked feature on S&N Communications.